One of the most exciting feelings in the world is at the moment when you take the leap to become an entrepreneur and launch your own start-up. 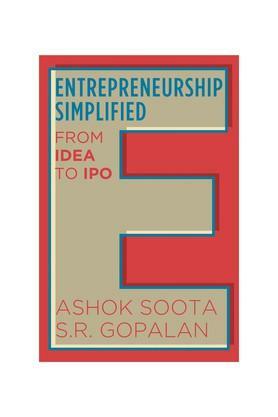 But in doing so, what are the things you should plan ahead for and what are the pitfalls you need to watch out for' In Entrepreneurship Simplified, Ashok Soota and S. R. Gopalan distil their decades of experience into a concise, comprehensive and practical guide for every aspiring entrepreneur as well as those who have already embarked on the entrepreneurial journey. From idea generation and validation to raising funds and dealing with VCs, building the organization and its mission, vision and values, defining a business and marketing strategy, creating and sharing wealth and finally, taking your company public through an IPO'Soota and Gopalan discuss the entire gamut of the entrepreneurial experience.Full of anecdotes, practical wisdom and key takeaways, Entrepreneurship Simplified is a definitive book on the subject that replicates the passion, fun and sense of fulfilment that accompanies the start-up adventure.